Pompeo said the United States’ assessment was “in spite of localized violence and irregularities”. Pompeo said: “The United States congratulates the people of Nigeria on a successful presidential election and President Muhammadu Buhari on his re-election. Africa’s largest cement producer, Dangote Cement, has maintained its dominance of the Nigerian market, accounting for 65 per cent of the total volume sold in the domestic cement sector in 2018. The company also exported 800,000 metric tonnes (MT) of cement to West African countries in 2018, strengthening Nigeria’s position as a cement exporting country, creating jobs in the economy, and earning foreign exchange. According to the details of Dangote Cement’s audited results for the year ended December, 31, 2018, it sold a total of 23.54 MT of cement across Africa indicating an increase of 7.4 per cent over 21.92 MT sold in 2017. Nigerian operations accounted for 14.18 MT representing an increase of 11.4 per cent over the volume of 12.72 metric tonnes sold during the preceding year. The increase in the Nigerian volume is attributable to higher building activities as the economy recovered from recession. The sales volume in Nigeria is quite significant given the turbulent market situation as the election period approached and people usually hedged in the construction industry during such periods. According to the Group Chief Executive Officer, Dangote Cement, Joe Makoju, financial performance by Dangote Cement was “driven by a strong increase in our home market, Nigeria, despite heavy rains and uncertainties about the election. Although Pan-African volumes were unchanged in 2018. “I am confident that we will see an increase in 2019, driven by higher volumes in Tanzania, Ethiopia, Congo and Sierra Leone. Now that we have gas turbines operating in Tanzania, we will also see increased profitability in the Pan-Africa region and this will help to improve overall Group margins,” he said. Across Africa, the cement Group posted a combined revenue of N901.21 billion, with Nigerian operations doing N618.30 billion, representing an increase of 11.9 per cent over N552.36 billion in 2017. The Nigerian economy was earlier projected to have grown by 1.9 per cent in 2017, meaning that Dangote Cement outperformed the domestic economy. Pan-African operations recorded revenues of N263.26 billion, an increase of 9.6 per cent over N258.44 billion posted in the corresponding period in 2017. Profit after tax stood at N390.32 billion in contrast to N204.25 billion while earnings per share rose from N11.65 to N22.83. The company’s directors are proposing a dividend of N16 per share. President Muhammadu Buhari has won the Presidential election in Lagos State, by defeating his rival, Atiku Abubakar of the Peoples Democratic Party, PDP, with a 132,798 vote margin. Buhari and Atiku The margin was lower than the 160,143 votes with which Buhari defeated Jonathan in 2015 in the megapolis. Buhari then polled 792,460 votes, while Jonathan got 632,327. Nigeria’s foremost commercial airline, Aero Contractors has introduced promo fares to help Nigerians who wish to travel to go and vote during the elections. The airline said the promo is its own contribution to support Nigeria’s conduct of successful election and also to encourage the citizens to travel to where they can cast their votes. Aero, in a statement, said effective Monday, February 18, 2019, it would commence the sale of tickets from N16,000 for travels between the 21st and the 25th of February, 2019 on all her routes to encourage Nigerians to travel to their various destinations in order to cast their votes. The special fare is only available online, it said. Lagos Chamber of Commerce and Industry (LCCI) has stated that the postponement of the Presidential election by INEC cost the nation no less than $1.2billion loss owing to the disruption of activities across the states. Independent National Electoral Commission (INEC) postponed the general elections a few hours to the commencement.The elections scheduled to commence Saturday, February 16 with the presidential and National Assembly elections, will be held February 23. Governorship and state houses of assembly elections will take place on March 9. The Director General of the Chamber, Muda Yusuf in a chat with The Guardian noted that several activities were disrupted as a result of the postponement adding that a slowdown should be expected in the days ahead till the elections are conducted. Yusuf stated that many SMEs’ activities were affected; the airports and seaports were shut down while many people have had to move from one location to another. He noted that the impact of the loss will be felt across the sectors of the economy, especially for activities scheduled for February 23rd, the new date for the elections. Real estate in general is a tricky investment option. People have the wrong belief that since real estate is an asset-backed investment and it has liquidation value, it is risk free. That is completely wrong. Property does provide more security compared to some of the other types of investments but it is not risk free. Its safety is subject to several factors, such as the market risk and specific risk. Market dynamics, macroeconomic developments, trends, demand and supply are some of the factors that determine the performance of a property investment. Kenya’s real estate sector is increasingly becoming a tricky investment option following the ever-increasing supply against declining demand, in the middle of a challenging macroeconomic environment. For the last three years, all available data point to the same direction. Τhe real estate market has been overestimated and the average investor has been dragged into absurdly high-risk investments in a market that should be at a much lower level. As per the latest house price index, the market is under pressure. The real estate sector has recorded its slowest quarterly growth in four years, giving weight to recent property market reports that have signaled a slump in demand despite increased supply of new housing units. The sharp recorded dip is linked to uncertainties in approval laws, difficulty in accessing bank loans and a general slowdown in spending power among buyers as well as oversupply. Fresh Kenya National Bureau of Statistics (KNBS) data, covering the third quarter ended September 2018, shows real estate recorded the slowest growth since the 5.4 per cent registered in the fourth quarter of 2014. According to available data there is an oversupply of commercial offices of 5.3 million square feet, which is expected to grow to 5.7 million square feet in 2019.The retail segment has an oversupply of two million square feet that is expected to increase with the opening of malls, such as Crystal Rivers in Athi River. The residential sector has increased supply in the middle to high-end residential sector, with a decreasing effective demand, hence recording a decline in occupancy rates in 2018. Cement consumption and production of galvanized sheets used for construction also fell this year, signaling the slowdown in real estate activity. Kenyan banks’ non-performing loan (NPL) ratios are among the most elevated among major economies in Africa, and are likely to be exacerbated by continued contractors and suppliers who owe lenders billions of shillings. Latest Central Bank of Kenya (CBK) data shows the ratio of bad loans to total loan book among Kenyan banks stood at 12.3 percent at the end of October. For the real estate sector, NPLs increased by Sh14.4 billion (48%) as a result of slow uptake of developed housing units, and delay in subdivision of land, indicated the CBK report. The real estate market in Kenya has entered the downward part of the market cycle. 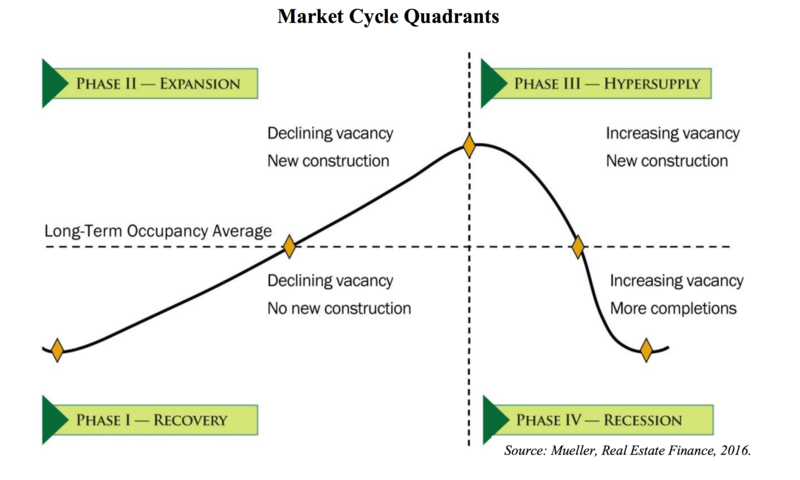 Kenya’s property market is now in the middle of the hyper supply phase. During this phase, the supply of new construction continues to come in, while demand falls. This causes occupancy rates to fall, and rental growth to slow. Values follow the same trend. Different suppliers of new construction begin to compete heavily for tenants and buyers. Eventually, market participants recognize the downturn and commitments to new co nstruction should theoretically slow or stop. If they do so soon enough, the market can avoid a severe downturn or even stay in this phase for a while. However, due to the lagged nature of construction, this doesn’t always happen. If new construction continues to come in faster than demand and occupancy drops below its long-term average, then the market falls into the final phase: recession. Kenya has been in this phase for almost two years now. It’s just a matter of time before it enters the next phase which follows hyper supply. That is recession. In this phase, massive oversupply, together with negative demand growth, causes rents and values to decline, leading to losses. Additionally, the price increases caused by hyper supply often force the central banks to raise interest rates and remove interest caps. This has the positive effect of slowing new construction, but also increases financing costs on existing properties. If interest rates are raised high enough, this can cause potentially painful losses. As the bid ask spread in property prices becomes too wide, market liquidity can become low or nonexistent, preventing landlords from cutting their losses easily by selling. Property owners stuck in this situation either need deep pockets to ride out the recession, or forced to make a distress sale leading to catastrophic losses. Since real estate is a large part of the overall economy, the entire economy suffers, which accelerates the real estate recession dynamics. Foreclosures begin to occur, and may even begin to accelerate. At this stage, shrewd investors and funds pick up real estate bargains. The market bottom doesn’t occur until new constructions and completion cease, or demand grows higher than the new supply being added. Some analysts claim that Recession has already started while others believe that recession is close. However you look at it, real estate sector is highly unpromising in the coming years. In the residential sector, most projections show that performance will remain flat. Commercial office overview for 2019, analysts forecast a decline of the average rental yield to eight per cent as a result of oversupply, with the average occupancy rates expected to decrease by at least 1.5 percentage points. Further, in retail, returns are expected to stagnate as a result of increased supply. The average expected trend is that occupancy rates are expected to decline leading to reduced yields and values due to oversupply and reduced demand. The beauty of market cycles is that there are always opportunities for those who understand the market and make rational decisions. During recessions, many opportunities are created for those who want to make a long term investments looking for bargains. They have to take a position which they will capitalize in the medium to long term when the market cycle will enter the recovery and expansion phase. Real estate, just like any other investment, involves risk as it is based on a risk return trade off. 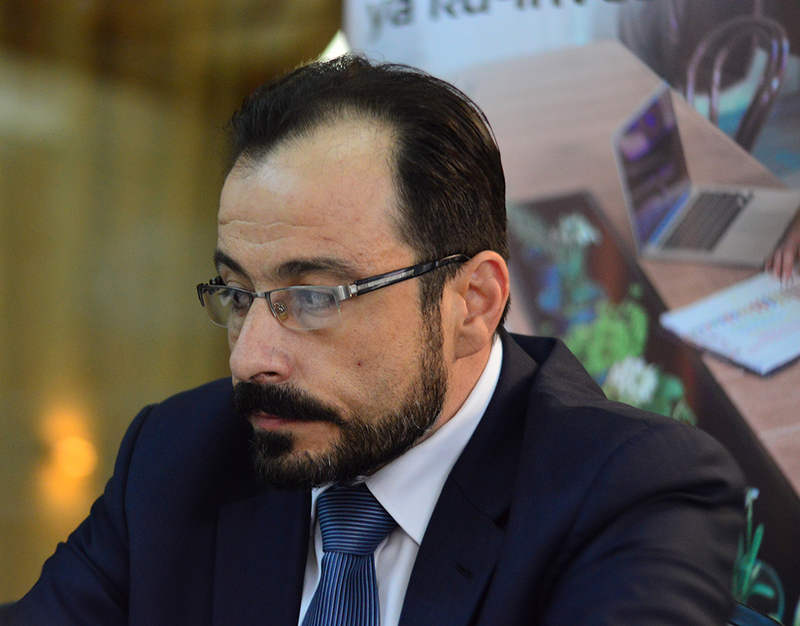 Investors need to seek for professional assistance in order to make the right decisions and understand correctly the market dynamics and the risks involved rather than following rumors which usually lead to irrational and risky choices. The nation’s border was shut down ahead of the Presidential and National Assembly elections earlier scheduled to hold today. The Independent National Electoral commission (INEC) had at midnight on Feiday postponed the elections by one week. Sequel to the postponement, the Comptroller General of Immigration, Muhammad Babandede, in a statement he personally signed said that the Minister of Interior, Abdulraman Danbazau has ordered that all borders be reopened due to the postponement of the elections earlier scheduled to hold today, February 16, 2019. He said that the Nigerian Immigration Officers will now continue their normal border conrrol duties to ensure that all persons crossing the nation’s land, air and sea travel with a valid ans genue document and also pass through recognized routes. Mixta Nigeria has listed a 5.28billion naira bond on the Nigerian Stock Exchange. The real estate firm noted that the funds from the bonds will be directed towards the creation of affordable housing. Kola Ashiru-Balogun, Managing Director at Mixta Nigeria joins CNBC Africa to discuss the details.